Bram Presser is the author of the new novel The Book of Dirt. His work has appeared in a variety of publications, including The Sleepers Almanac and Best Australian Stories. 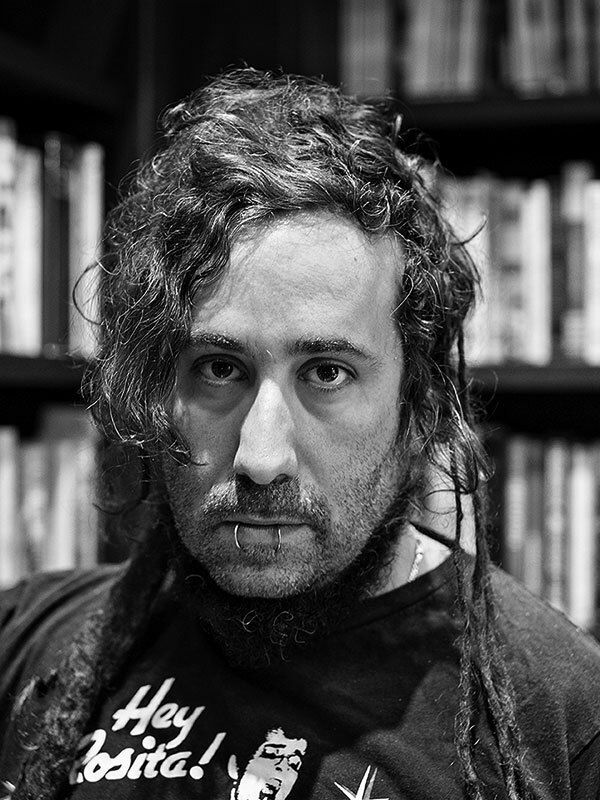 He describes himself on his website as a semi-reformed punk rocker, recovering academic, and occasional criminal lawyer. He's based in Australia. Q: How closely was The Book of Dirt based on your family history, and what did you see as the right balance between history and fiction as you wrote this novel? A: I didn’t really set out to write a book. I just wanted to find out what happened to my grandparents during the occupation of Prague and the Holocaust. They had never spoken about it and then, after they died, an article was published claiming my grandfather was handpicked to be the literary curator of Hitler’s Museum of the Extinct Race. So, for me, initially, it was intended to be a personal investigation just to put my mind at ease. These were two of the people I loved most in my life and I hadn’t known them at all. It soon became apparent that there were no records or, if there were, I couldn’t gain access to them. Plus, most people who might have known the story were dead. All I had were these little scraps and anecdotes and a few photos, so I began to imagine their lives and writing them down as “characters”, only to find that I was getting to know them in ways I hadn’t anticipated. Fiction was revealing essential truths that the search for documented “fact” had blinded me to. As luck would have it, down the track, a lot of the records fell into my lap – the Jewish Museum of Prague found some Nazi worksheets, a student of my grandfather from before the war (now in his 90s) tracked me down, my cousin found a bunch of letters smuggled out of concentration camps to my great grandmother in Prague – so the book was written almost in real time with the “characters” playing off the records. Other than the magical realist elements, I’d say it’s pretty close to what actually happened or, at the very least, my best-informed guess at what actually happened. Q: What type of research did you do to write the book, and did you learn anything that especially surprised you? A: I spent eight years traveling the world, following even the slightest scent of their story. That meant digging through archives, visiting anywhere that they had been during that period, whether it was country Czech towns, cities, concentration camps, you name it. I interviewed lots of survivors about life in the camps, as well as family members and friends who had heard bits of the story from either of my grandparents. I sat with rabbis and academics debating various texts and legends, both Jewish and Czech, that would inform the story. And I read literally hundreds of books, from the wider survivor narratives to narrow minutiae, like an academic study on the concentration camp postal system. There were so many surprises along the way – coming to understand the camp smuggling networks and my grandmother’s role in it, finding out that non-Jewish family members like my great grandmother sometimes visited their half-Jewish family in Theresienstadt. Also, I’d never heard of the Talmudkommando, a team of scholars that sorted stolen Jewish books, or the disturbingly surreal artifice of the Czech Family Camp at Birkenau. Then there was the discovery that my grandmother was an accidental witness to major historical moments, living next door to where the paratroopers hid after the assassination attempt on Heydrich during Operation Anthropoid and arriving in Birkenau the day before the uprising. My jaw spent pretty much eight years on the floor. Q: How much about your family’s history did you know as you were growing up? A: How much I thought I knew? Most of it. How much I actually knew? Next to nothing. My grandparents were traumatised into silence. They just didn’t speak about it. We built stories of their survival though, looking back, I don’t know what caused us to think there was any truth to them. There were little snippets – that my great grandmother wasn’t Jewish, that my grandparents met in a concentration camp, that my grandfather taught children in Birkenau in the shadow of the crematoria. But as to the substance, appreciating the magnitude of my great grandmother’s heroism or the aspects of my grandparents’ experiences that I hadn’t even heard about in the existing literature on the Holocaust – we really had no idea. A: It will come as little surprise to anyone who reads The Book of Dirt that I hugely admire Kafka, Sebald, Coetzee and Ozick. The two writers who have influenced me most, however, are probably the Croatian writer Daša Drndić and the Australian Arnold Zable. 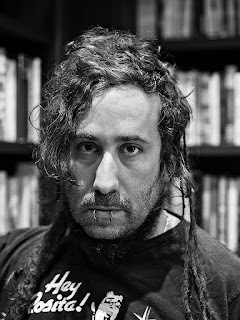 A: I’m still decompressing from the eight-year existential crisis that was writing The Book of Dirt, though I have a few things on the boil – a couple of novels in their formative stages, some stories and a book for kids. Mostly, though, I’m a stay-at-home dad to my 18-month-old daughter which is really the greatest thing I’ve ever done. 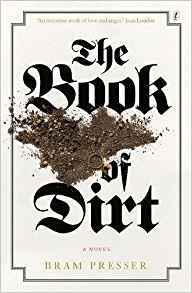 A: Just that I’m so excited for The Book of Dirt to hit shelves in the U.S. and hope it intrigues, engages and challenges readers in equal measure. I also can’t wait to get over there to catch up with old friends from my punk rock days in Yidcore and make new ones through my writing. At least this time round, I won’t be screaming into a rubber chicken or washing hummus out of my hair every night. That’ll be a pleasant change.